The number of police officers per person is falling nationally, along with reported crime. A report released Thursday by the Bureau of Justice Statistics (BJS) shows there were 15.1 police officers per 10,000 U.S. residents in 2013. That’s down from 15.4 police officers per 10,000 residents in 2007, the last time the BJS surveyed police departments around the country. 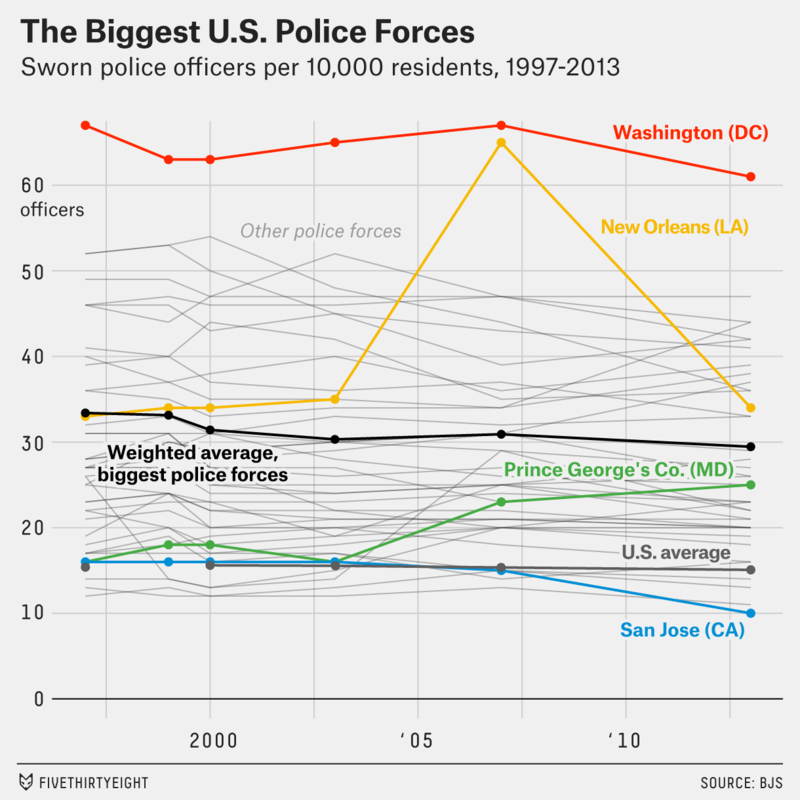 The country’s biggest police departments are responsible for a big part of the decline, as big-city forces have shrunk even as the populations they serve have grown. While the raw number of sworn officers (those with general arrest powers) has risen since 2007, it didn’t grow as fast as the U.S. population. And the number of officers working in the country’s 50 biggest departments fell during that time, by about 2,000 officers.1 Since the overall population of the jurisdictions that house those departments increased by about 4 percent during those six years, that means the proportion of people in those places every day2 who are police officers has declined by about 5 percent, to 28.5 police officers for every 10,000 residents. Remarkably, the total number of officers in the biggest forces has declined even since 1997, a period in which the population of people covered by those departments3 grew 12 percent. The BJS numbers reflect quirks in individual jurisdictions’ situations or borders. New Orleans saw a big spike between 2003 and 2007 in the number of police officers per capita, largely because the city’s population plummeted after Hurricane Katrina in 2005. Then the per capita number dropped again, as the city’s population partially rebounded and the department shrank by more than 150 officers. Per capita police size could also depend on how tightly a jurisdiction’s borders envelop a city center or whether they include suburban areas. And cities that many people commute into may look like they have unusually large police presences because their official population figures underrepresent the number of people who spend time there; the daily influx of hundreds of thousands of people into Washington is one reason why the capital has the highest per capita police presence. The biggest changes in per capita police-force sizes aren’t necessarily driven by crime rates and policing needs. City budgets play a big role. Prince George’s County, Maryland, just outside Washington, has increased its number of sworn officers by 56 percent per capita since 1997, the largest increase among big departments. The county had budgetary leeway beyond the police department: It also hired more firefighters. The police department in San Jose, California, which has shrunk the most since 1997, has experienced what the Mercury News called a “running exodus of officers” because of a budget crunch. Budget constraints also affect our ability to analyze police-force sizes. Thursday’s report, which gave results of the 2013 Law Enforcement Management and Administrative Statistics (LEMAS) Survey, a semiregular study of local policing, is the first BJS update of local police-force sizes in six years, and the data is already two years old. The BJS report updates many other stats about police departments. It shows that just 12.2 percent of sworn police officers are women, up just 2 percentage points from 2000. One in 8 police officers is black, in line with the U.S. as a whole. One in 9 police officers is Hispanic, more than double the ratio in 1990, but below Hispanics’ share of the U.S. population of roughly 1 in 6. The BJS breaks out police-force sizes for the 50 biggest departments each time it reports the results of its survey. The identity of those 50 police forces changes as departments grow or shrink between surveys. I compared the 2007 and 2013 numbers by looking at just the 48 departments that ranked in the Top 50 each time — excluding Oklahoma City and Long Beach, California, from the 2007 list and Portland, Oregon, and DeKalb County, Georgia, from the 2013 list. In all comparisons in this story between years I used only departments for which data was available in each year of the comparison. During their shifts, that is — we’ve written about how most of the officers in many departments don’t live in the city they serve. The 44 that were in the Top 50 in both 1997 and 2013 combined had 2,000 fewer officers in 2013.